From exceptional lighting to premium turf throughout the facility, Keystone State Baseball & Softball Academy is the place to be if you are serious about baseball or just love to be around the game. Keystone State Baseball and Softball Academy is one of the largest indoor baseball and softball academies in the country. There are seven batting cages of varying lengths, including a PX2 Pro Batter System. The Academy also offers Casey Pro batting machines, along with other training devices, for players to use at their disposal. 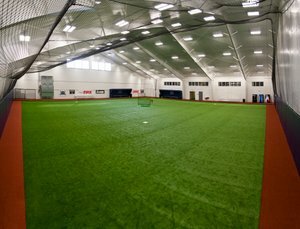 The Academy's indoor arena field can house game play with 90 foot bases and the entire playing surface is enclosed by netting for players to play games, take infield or batting practice, and much more. The Academy also has three pitching lanes, and two smaller instructional areas on the cage side of the facility. The birthday party suite and a family lounge with Wi-Fi access round out the amenities that the Academy has to offer. 2015 will see a new era for the Academy with the opening of Prep Baseball Report Pennsylvania offices on the premises and advanced program offerings for physical development with Power Train Fitness housed on site. From developmental classes to advanced individual training for the college-bound athlete, Keystone State Baseball & Softball Academy provides the best baseball and softball training in the area. The Keystone State staff is committed to operating the best indoor baseball and softball complex in the region with state of the art facilities, top-rate instruction and a caring, professional staff. Our staff encourages you to stop by today to see all that Keystone State Baseball & Softball Academy has to offer and welcome you to take a tour of the facility.